Excitement escalated when we discovered that Warner Bros. was opening the movie set of the Harry Potter series to the public. Just a short train trip from London to Watford Junction where a duly decorated shuttle bus takes you straight to the studios about 15 minutes away. We purchased tickets online before we left home and arrived at the studios about forty-five minutes before our tour time of 11 a.m. While waiting to get in line for our appointed time, we strolled around the lobby full of huge poster pictures of the cast from the movies and noticed, suspended above our heads in the corner, the Ford Anglia that was made to fly. A peek in the gift shop only left me thinking of a Christmas gift list for all the Potter fans in our family. After a coffee and a snack, we got in line to begin our tour. 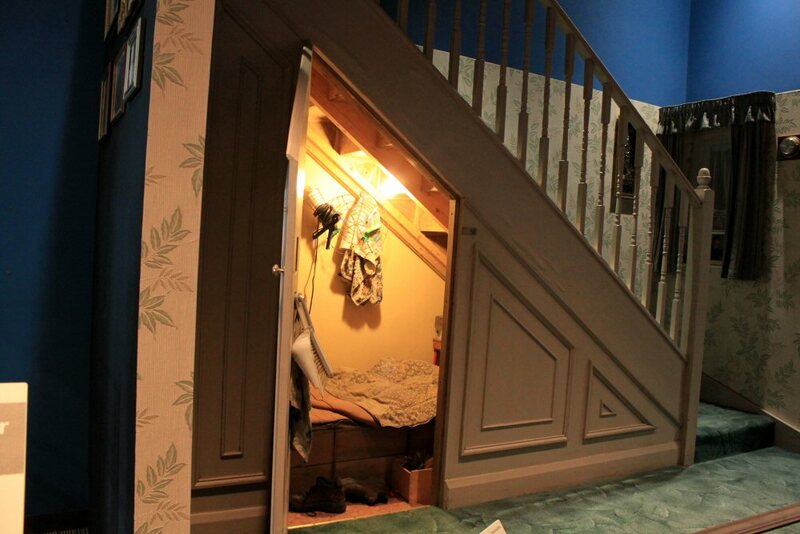 As we wound our way to the entrance, we were enticed with a mock up of Harry's room under the stairs on Privet Lane. There on the shelf above the bed were the iconic glasses worn by Daniel Radcliffe. I'm sure in the 10 years or so it took to make all the movie sequels, there were more than one pair. He did grow. 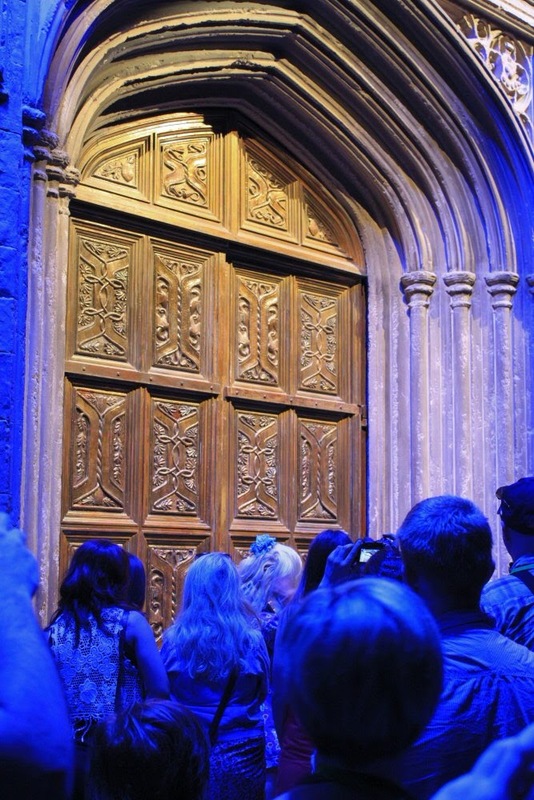 A large group of us were herded into a room where we watched a short video before entering another room with a familiar giant door before us--the door to the banquet hall of Hogwarts. Sure enough when the doors opened, we were right there and the magic of Warner Brothers movie making began. The banquet hall didn't seem as large as what was on the screen in the movie but it was still very impressive. 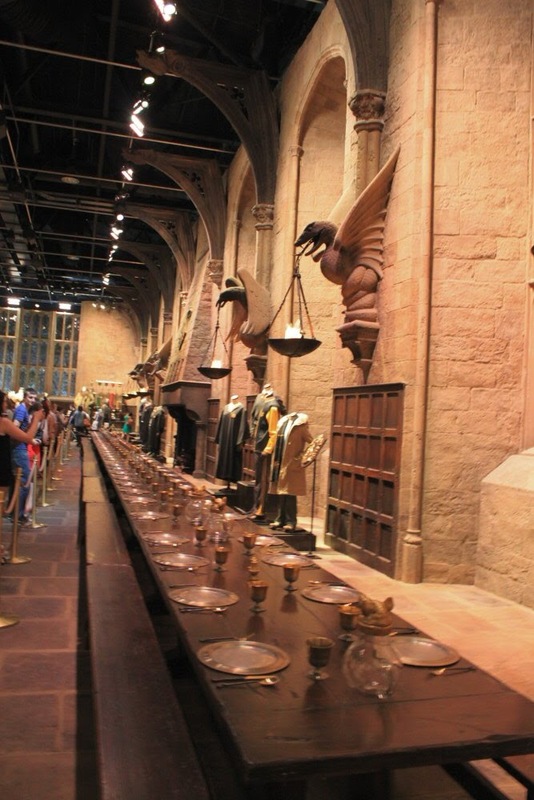 Tables were set and along the sides were original costumes representing the houses of Gryffindor, Slytherin, Ravenclaw, and Hufflepuff. Once our allotted time was up in the banquet hall, we were directed out to the large studio area where we could leisurely explore all the various sets, props, costumes, etc. that were used in all the movies. Each of us had an audio guide that we could start at each station along the way. 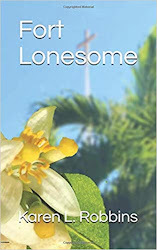 It was more of an IPod-type guide where it was possible to also see videos and pictures of the making of the movies as well as interviews with people involved. It was very well done. 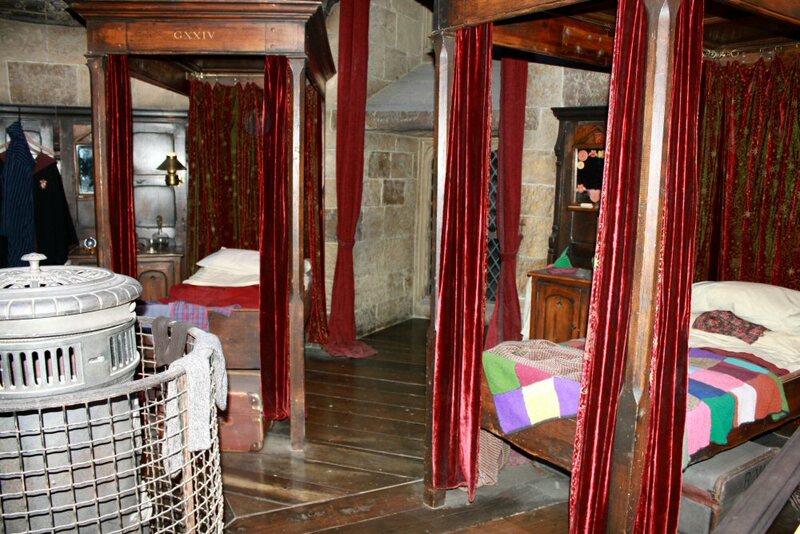 The Gryffindor dorm room where Harry and Ron bunked was interesting. 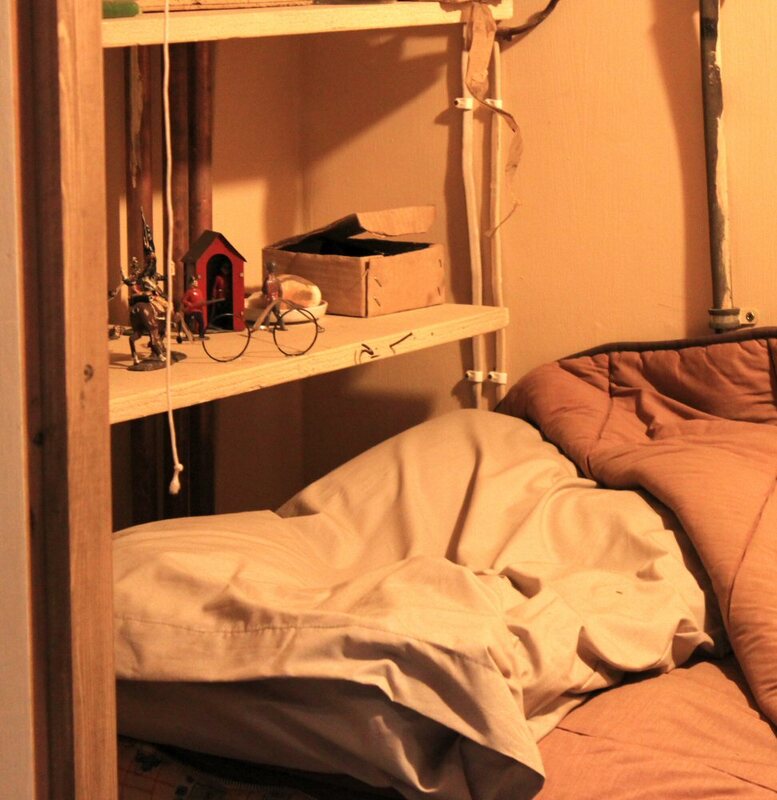 As the audio explained the beds were the right size for the actors when they first started filming but by the time the last movie was made, they had outgrown them and needed to curl up tight to appear to still fit. The colorful quilted bed in Ron's. 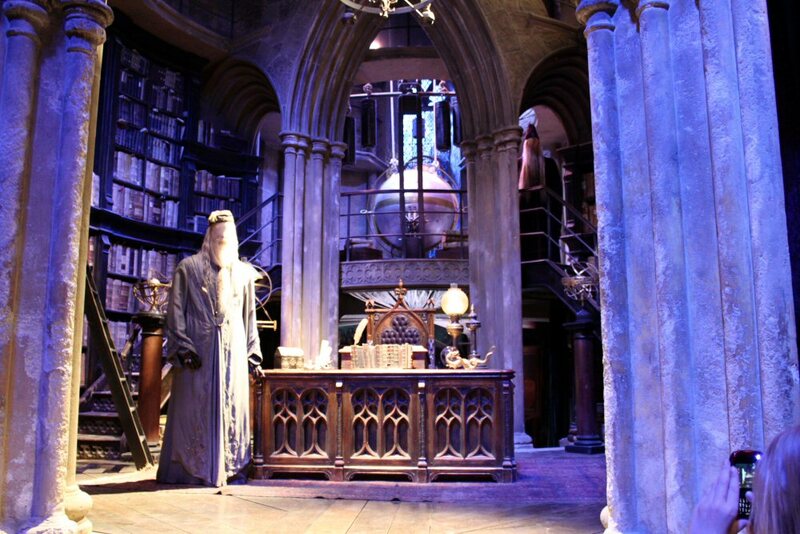 Dumbledore's office was amazing. You can't see it in the picture and it was a little difficult to see from where we stood as well but there is a large telescope up in the ceiling. 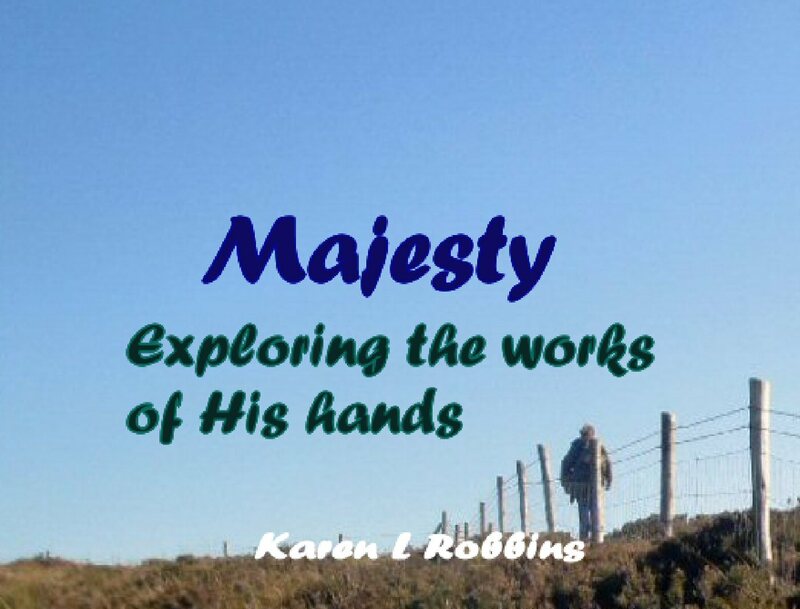 All of the elements of the story line were there and visitors were allowed all the time they needed to search them out and find them. Many of the special effects, most helped along by green screens, were displayed. The brooms and flying motorcycles of course were attached to mechanical devices that made them move while being ridden and then the background added onto the green screen later would make it seem to really fly. 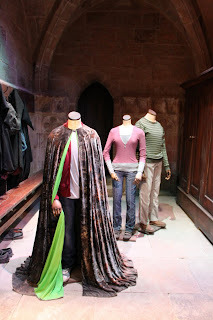 But how did Harry become invisible under that cloak of his father's? Green screen material. 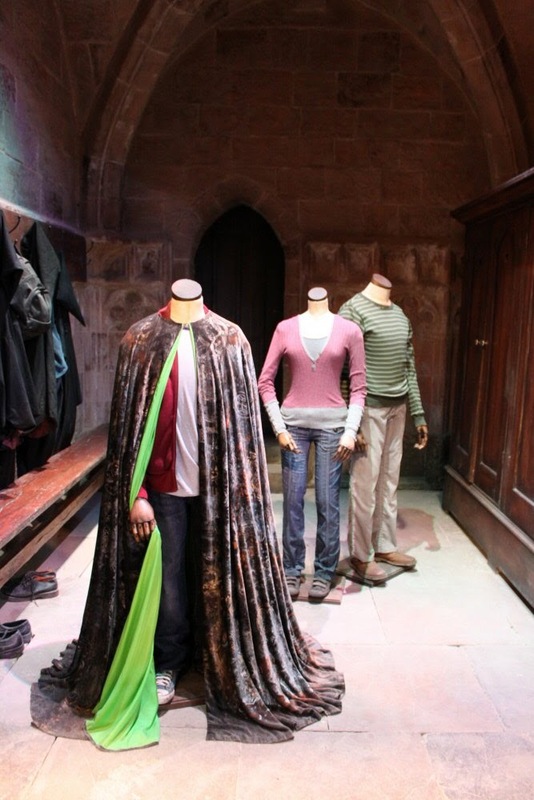 Look closely at the picture of the cloak on the mannequin and you'll see that a part of it is folded back to reveal the green material. Ah, the magic of movie making. But some of the best was yet to come.